Pterosaurs were common in the Jurassic period. The Jurassic period is an interval of about 55 million years defined on the geologic time scale as spanning roughly from 200 to 145 million years ago (mya), from the end of the Triassic period to the beginning of the Cretaceous period. The Jurassic period is noteworthy as the first of two periods that together comprise the Age of Dinosaurs. The start of the Jurassic period is marked by the major Triassic-Jurassic extinction event, which happened just before the supercontinent Pangea started to break apart. It is estimated that over 20 percent of marine families and 40 percent of terrestrial tetrapod (four-legged vertebrate) families went extinct, including all large Crurotarsi (a group of non-dinosaurian reptiles) and many of the large amphibians. This extinction event paved the way for the dinosaurs to assume the dominant roles in the Jurassic. An immense wealth of fossils have been found from the Jurassic period. These provide valuable information in understanding the evolution of life on Earth. The Jurassic period is important for another reason: The oilfields of the North Sea, near the United Kingdom and Norway, have much of their origin in this period. Many people are familiar with the Jurassic period because of the popular movie, Jurassic Park, based on the book by Michael Crichton. Although many of the dinosaurs depicted in that movie, such as Tyrannosaurus rex, actually belong to the subsequent Cretaceous period, the power of the media did bring a greater appreciation of, and interest in, the history of life on this planet. The Jurassic period was named by Alexander Brogniart for the extensive marine limestone exposures of the Jura Mountains in the region where Germany, France, and Switzerland meet. 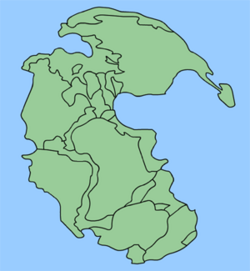 During the early Jurassic, the supercontinent Pangea broke up into North America, Eurasia, and Gondwana (originally called Gondwanaland, this area included most of what today are the landmasses of the Southern Hemisphere, including Antarctica, South America, Africa, India, and Australia). In the late Jurassic period, the southern continent, Gondwana, started to break up. Climates are assumed to have been warm with no evidence of glaciation. As in the Triassic period, apparently there was no land near either pole, and no extensive ice caps existed. The geological record of the Jurassic period is well exposed in western Europe, where marine sequences are found along the coasts. A shallow sea (epicontinental sea) called the Sundance Sea was present in parts of the northern plains of the United States and Canada. Most Jurassic exposures in North America are continental. Important Jurassic exposures are also found in Russia, India, South America, Japan, Australasia, and the United Kingdom. During the Jurassic, the "highest" life forms living in the seas were fish and marine reptiles. The latter included ichthyosaurs, plesiosaurs, and marine crocodiles of the families Teleosauridae and Metriorhynchidae. The first plesiosaur fossil, discovered by Mary Anning, 1821. Ammonites (extinct, shelled cephalopods) were particularly common and diverse, forming 62 biozones. Ichthyosaurs were abundant in the Jurassic period. They were giant marine reptiles that had a porpoise-like head and a long, toothed snout, as well as a large tail fin. Ichthyosaurs averaged 2 to 4 meters (6.5 to 13 feet) in length (although a few were smaller, and some species grew much larger, up to 23 meters (75 feet) in length). Plesiosaurs were large aquatic reptiles as well. They first appeared in the late Triassic period and thrived until the Cretaceous-Tertiary extinction event at the end of the Cretaceous period. Despite being large Mesozoic reptiles, they were not a type of dinosaur. The typical plesiosaur had a broad body and a short tail, as well as limbs in the form of flippers. As a group, the plesiosaurs were the largest aquatic animals of their time, and even the smallest were about 2 meters (6.5 feet) long. They grew to be considerably larger than the largest giant crocodiles, and were bigger than their successors, the mosasaurs. In comparison, the modern whale shark reaches 18 meters (59 feet), the sperm whale 20 meters (65.5 feet), and the blue whale 30 meters (98 feet). Their predecessors as rulers of the sea were the ichthyosaurs. On land, large archosaurian reptiles (a group of diapsid reptiles that included the dinosaurs and pterosaurs, among others, as well as the above-mentioned Crurotarsi) remained dominant. Great, plant-eating dinosaurs, the sauropods, roamed the land, feeding on prairies of ferns and palm-like cycads and bennettitales. They were preyed upon by large carnivorous dinosaurs, the theropods, such as Allosaurus, Ceratosaurus, and Megalosaurus. Both the sauropods and theropods belong to the "lizard hipped" or saurischian branch of the dinosaurs. 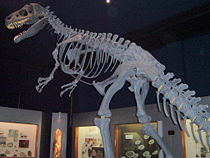 A replica Allosaurus skeleton at a New Zealand museum. Allosaurus was a large carnivorous dinosaur with a length of up to 12 meters (39 feet). It was the most common large predator in North America 155 to 145 million years ago, during the Jurassic period before the era of Tyrannosaurus rex. In the late Jurassic period, the first birds evolved. Ornithischian (bird-hipped) dinosaurs were less predominant than saurischian dinosaurs, although some, like stegosaurs and small ornithopods, played important roles as small and medium-to-large (but not sauropod large) herbivores. 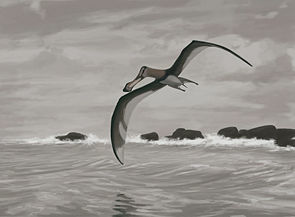 In the air, pterosaurs were common, filling many ecological roles now taken by birds. Pterosaurs ("winged lizards"), often referred to as “pterodactyls,” were flying reptiles of the clade Pterosauria. They existed from the late Triassic to the end of the Cretaceous period. Pterosaurs were the first known vertebrates to evolve flight. Their wings were formed by a membrane of skin stretching from the torso to a dramatically lengthened fourth finger. Earlier species had long, fully-toothed jaws and long tails, while later forms had a highly reduced tail, and some lacked teeth. Most pterosaurs were moderately sized, but some reached very large sizes. The arid conditions that had characterized much of the Triassic period steadily eased during the following period, especially at higher latitudes; the warm, humid climate allowed lush jungles to cover much of the landscape (Haines 2000). Flowering plants had not evolved yet, and conifers dominated the landscape, as they had during the Triassic period. Conifers, in fact, were the most diverse group of trees, and constituted the greatest majority of large trees during this period. Extant conifer families that flourished during the Jurassic period included the Araucariaceae, Cephalotaxaceae, Pinaceae, Podocarpaceae, Taxaceae, and Taxodiaceae (Behrensmeyer et al. 1992). The extinct, Mesozoic, conifer family Cheirolepidiaceae dominated low latitude vegetation, as did the shrubby Bennettitales (Behrensmeyer et al. 1992). Cycads were also common, as were ginkgos and tree ferns in the forest; smaller ferns were probably the dominant undergrowth. Caytoniaceous seed ferns were another group of important plants during this time, and are thought to have been shrub to small-tree in size (Behrensmeyer et al. 1992). Ginkgo-like plants were particularly common in the mid- to high northern latitudes. In the Southern Hemisphere, podocarps were especially successful (Haines 2000), while ginkgos and czekanowskiales were rare (Behrensmeyer et al. 1992). Behrensmeyer, A. K., J. D. Damuth, W. A. DiMichele, R. Potts, H. D. Sues, and S. L. Wing (eds.). 1992. Terrestrial Ecosystems Through Time: The Evolutionary Paleoecology of Terrestrial Plants and Animals. Chicago: University of Chicago Press. Haines, T. 2000. Walking with Dinosaurs: A Natural History. New York: Dorling Kindersley Publishing. This page was last modified on 1 December 2008, at 14:17.